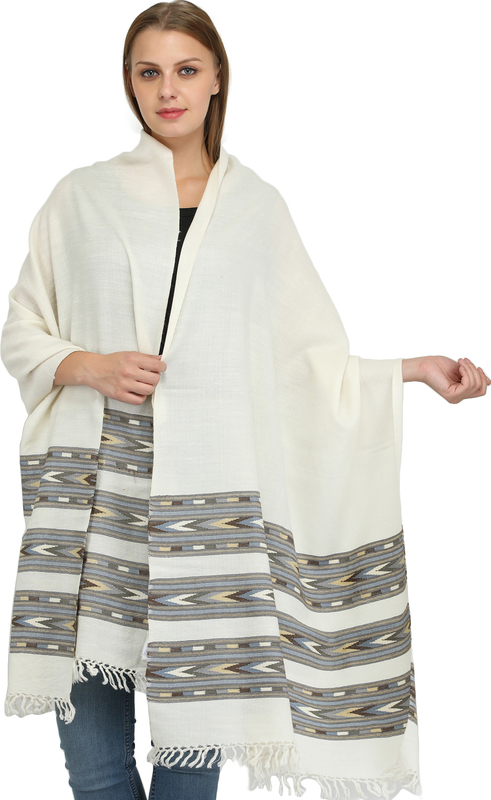 Simple and stylish, this is one of those shawls that you set eyes on once and realise is a must-have. Designed to go with practically any outfit, no matter the colour or ethnic appeal, this shawl is made from pure wool to keep you looking fashionable this season. The one-of-a-kind Kinnauri weave has been distributed across three panels along the tasselled edges of this shawl. A work of considerable beauty and skillful labour, the milk-like white of the field is brought out by the select neutrals that have been employed in the weave.